This is a guest post by Troy Kozlowski. This guy knows how to pull in autographs and it's been great getting to know him through Opening Day Cards. Thanks Troy! I am a huge fan of both you and the Cardinals. I think you are an amazing pitcher and so glad that you are on the Cardinals. (You could personalize it with an experience that you had or some accomplishment that the person you are writing to has accomplished.) I was hoping that you could autograph my card for me. I have included a self-addressed, stamped envelope so that you could send it back to me. Thank you so much for taking the time out of your busy day to read my letter and hopefully you’ll get back to me soon. 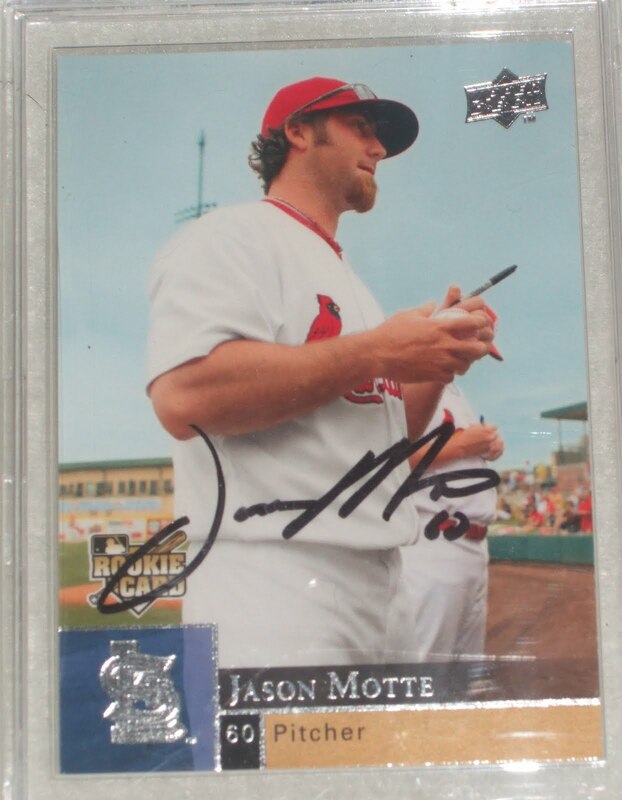 And if this player takes the time to autograph your card, you could end up with the great autograph you see at the top of this post! The most important thing to include is an envelope with your name and address so it can come back to you; but, for a chance to get a success you will have to add a stamp on the envelope coming back to you. If you are sending anything other than a trading card you must go to your local post office to check how much postage you need to put on your package so that it will come back to you. This is a great link to use to get team addresses to send your cards to: http://www.sportmapworld.com/map/baseball/north-america/mlb/. Collecting autographs is a great hobby to get into. It is great for people that cannot get to the ballpark to get autographs from the players in person. An average wait for the return of your autographed card can be anywhere from 5 days to 3 years; but, a normal wait is usually about 3 months. Some bad things that can happen are: if you send your card to the wrong address you may get everything back with a yellow slip from the post office, which is called a RTS (Return To Sender). Also, if the player is in a hurry they could put the signed card right in the envelope after signing and it can get smudged. If you really want to get into the hobby of collecting autographs, Harvey Meiselman creates a comprehensive book for every sport, every year, with the players’ home addresses. It is so great to use and you get the address for almost every current and retired player. The link to see how you could purchase it for yourself is here: http://www.sportsaddresslists.com/ . This is the best product to obtain retired players’ addresses and, during the offseason, current players. The Baseball Hall of Fame, in Cooperstown, NY, has recently added his Baseball Address List to the permanent collection in their library. Harvey gives updates three times a year for addresses that he found out didn’t work and gives a new current address. It is a great resource to have. A great website to use is Nolan’s TTM, He updates his website whenever he gets a success. His website is: http://www.nolansttmgraphs.webs.com/. Another great website that is always updating their user’s success is: http://www.fanmail.biz/ and click on the tabs for any of the sports and you get to see who signs autographs. I also use this website to see what he has gotten back lately: http://www.sportsautosttm.com/. Even though I used the above example with a baseball player, you can send to NBA, NFL, and NHL players; but, MLB has the highest success rate if sending to players. I have been collecting since last Spring Training and I have just over 100 autogtaphs and still collecting. On one website that I have come across, someone did a test to see if he will have a higher rate of return if hand-writing the letter opposed to typing it. His study showed that he had a higher rate of return if he had hand-written the letter to the player. It is a really fun hobby and it blends right in with the hobby of collecting. The most important thing to keep in mind is to not send something of value, because you may NOT get it back. The players are not forced to sign items; they just do it for their fans! This is a nice introduction to TTM autograph collecting. I would also suggest that people check out sportscollectors.net if they want to get into the hobby. SCN members keep track of their successes and failures so you have a pretty good sample size to determine the likelihood that your item will come back. While it does have a yearly subscription rate, it has easily saved me money in terms of wasted stamps and items since not all players sign TTM at the same rates. Hey guys...just wanted to check in.I come to the blog EVERY day,hoping for something,anything new. And every day...nothing! Just wondering when you guys are gonna get rolling again? Spring training is only a few weeks away,and it's looking like the Red Sox (assuming good health) are gonna be an unprecedented natural disaster unleashed upon the rest of baseball,but specifically the AL East, and even more specifically the Yankees and Rays!! Just wondering when we'll hear from you guys again? I better have that baseball plates signed too. Is that even possible? Especially during home run moments. I'd like to have one. Thanks for this! I've always wanted to get my bat autographed, but for now I don't think that's possible, so I'll do it this way instead.